Led by sitar maestro Pt. 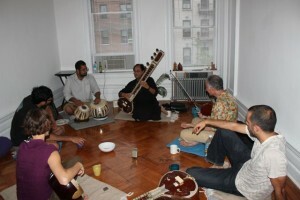 Krishna Bhatt, the classes will introduce students to the techniques and compositions of the Maihar Gharana (school) of the legendary Baba Ustad Allaudin Khan. Sessions will begin Monday, May 2nd, 2011. A second 8 week session will begin in July. This course will provide students with an in-depth exploration of raga form, with a special emphasis on composition and improvisation techniques. The class will have a special focus on the sitar, but it is open to any instrument (Western or Indian, tuned to play in a key of C#). Classes will be held Mondays at 7:30pm. Students at all levels are encouraged to participate. The beginner class will cover many of the basic techniques of instrumental Hindustani music, such as meend (bending of notes), bols (rhythmic patterns) and paltas (instrumental exercises). This course is perfect for anyone interested in beginning their journey on the sitar, though other instruments are also welcome, so long as they can be tuned to the key of C# or D. Classes will be held on Wednesday evenings at 7:30pm. Can you please give me your location? I live in Queens and I am looking to join a sitar and a harmonium class. My email is kem_singh@yahoo.com. A fascinating discussion is worth comment. I do think that you should publish more about this topic, it might not be a taboo matter but generally people don’t discuss such issues.